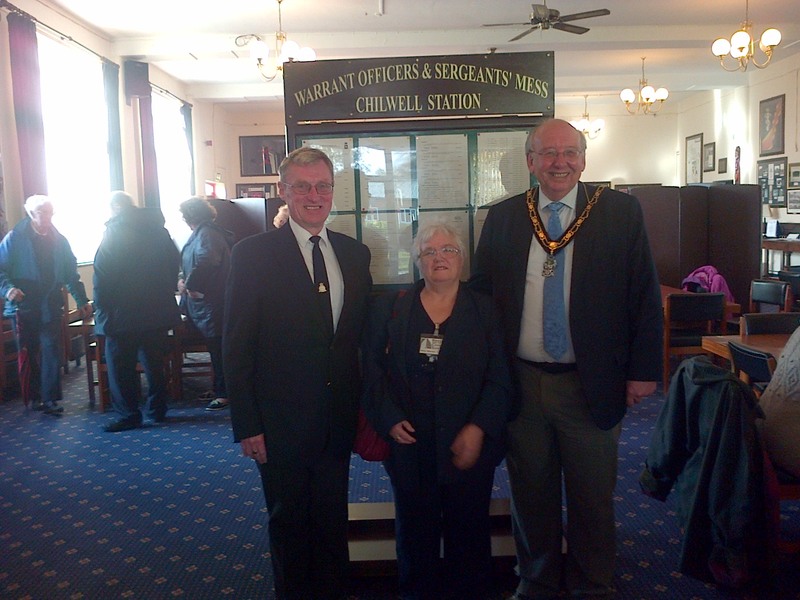 The Mayor of Broxtowe, Cllr Stan Heptinstall (right) with James McCloskey, Station Staff Officer (left) together with Eileen Atherton, Hon Secretary of the Beeston & District Civic Society in the Officers Mess at Chetwynd Barracks after the postponed Heritage Open Days tour which took place on 2lst October 2014. The text report below is by Steve Austin who is one of the Editors of Bramcote Today. The visitors including Councillor Stan Heptinstall, the Mayor of the Borough of Broxtowe, received a presentation from James McCloskey, Station Staff Officer, covering the history of of Chilwell Station including the building of Number 6 National Shell Filling Factory under the direction of Lord Chetwynd which produced over 50% of the heavy artillery shells fired by the British Army in World War One, the 1918 disaster when the explosive mixing shed exploded, the establishment of the Central Ordnance Depot in the 1930’s which supplied many of the vehicles and tanks used at El Alamein and on D-Day, the introduction of the Army’s first computer data processing centre in the 1960’s in Headquarters of Vehicle Organisation to the present day role as a home to a number of Royal Engineer units including the one currently building medical facilities in Sierre Leone and the unit which prepares troops for deployment overseas. After the presentation, the visitors viewed the memorial to the workers who died in the 1918 disaster and the Garrison Church before being treated to refreshments in the Warrant Officers/Sergeants Mess, the latter being home to many historical photographs of the site.